The Nook HD is still a worthy tablet contender, even though there are now many more Android tablets that match its low price. 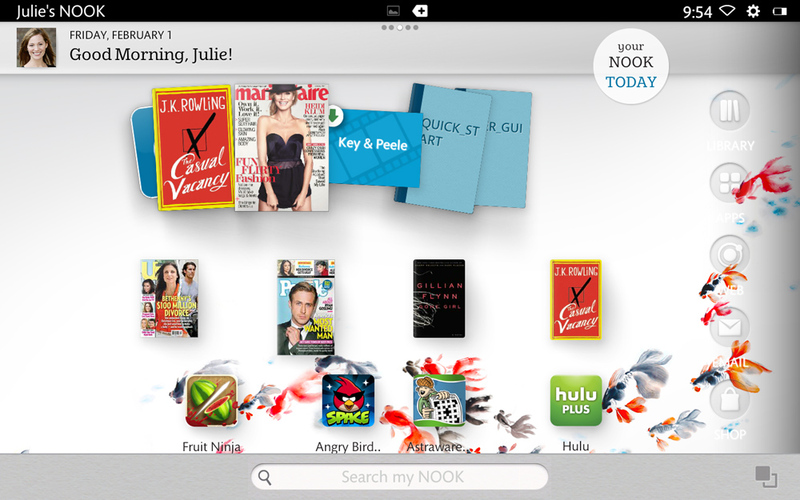 Cost isn't everything, and the Nook's features are compelling. Back when Barnes & Noble released the Nook Color, the company created a new category of Android tablet: a low-cost, paired down device with a focus on a certain kind of user. They called it a “Reader’s Tablet” and made clear that they weren’t trying to compete with the Apples and Samsungs of the world. Other companies followed suit, starting with Amazon. And now you can find not-so paired down tablets at the same low price. That begs the question: why would anyone buy a Nook when the Nexus 7 has more features? The answer lies in the audience. B&N continues to make tablets for people who love to read, and the Nook HD is a great example of that. Coming in at $200 for the 8GB version and $230 for the 16GB, the HD has plenty going for it: a higher resolution display than the competition, an attractive, easy-to-use interface, an exceptional reading experience, and now more multimedia content. But even with all that, is it a more compelling tablet than what Google offers? Barnes & Noble dropped the distinctive design seen on the Nook Tablet and Nook Color and started from scratch for the Nook HD. The result is a lighter, more holdable tablet. The soft-touch back has a grip-friendly contour just like the Nook Simple Touch e-reader, so it’s more comfortable in the hand and not likely to slip. The raised power button and volume toggle are easy to find by touch and in the same position as on the Nook Tablet. The stylized n button remains in place just below the screen. The plastic bezel around the 7-inch display is wider than it needs to be so that users have a place to rest their thumb that isn’t the screen. Though it means the tablet is a little wider than absolutely necessary, it’s a good choice considering what most people will do with the HD: read books and magazines. Still missing is a front or rear-facing camera. Though the ability to video chat would be nice, this feature isn’t a priority for everyone. B&N replaced the Micro USB port from previous tablets with a proprietary 30-pin port for connection and charging. We understand their reasoning for this – you can now output to an HDTV with a special adapter, among other things – but still don’t like that the connecting cord is proprietary instead of universal. Lose it, and you must buy another. Barnes & Noble has always prioritized reading with its tablets, and that means a great display. The 7-inch IPS screen offers wide viewing angles, some sunlight readability, and an HD resolution of 1440 x 900 pixels. This is one of the highest – if not the highest – resolutions available on a 7-inch Android tablet. Sometimes, a super high resolution on a small screen means tiny buttons and hard to read text, but not here. The reading experience is excellent and the fonts are crisp. Full-color magazine and comic book pages are gorgeous. Though reading on a tablet isn’t as comfortable as on an E Ink e-reader, the Nook makes the experience as comfortable as possible in this format. 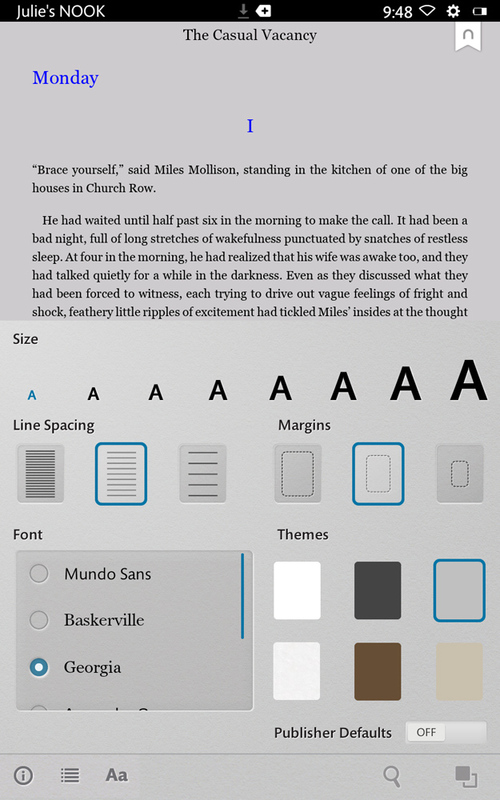 Inside e-books, the Nook HD gives readers control over how things look for maximum comfort: eight text sizes and six fonts, line spacing and margin control, plus themes that change background and text color. As usual, turning pages only requires a tap at the edges or a swipe. When using the Nook one-handed, we were able to turn pages with our left hand by swiping with the thumb. You won’t need to reach all the way across the screen to accomplish this. Kids e-books are on a whole other level. We like that they look almost like their print counterparts but with digital enhancements that keep kids engaged and improve reading skills. As nice as the e-book experience is, one of the major reasons to go with a tablet over a dedicated e-reader is for the full-color, full layout digital magazines and comic books. Readers can either read a magazine in full layout mode or switch to ArticleView, which shows a plain text version with all the same text options as eBooks. Since the display is so crisp and pixel dense, you may not need ArticleView, even when fonts are small, since they remain crisp and readable. This is also true for comics. For those who can’t read small text, no matter how crisp, the comic book engine offers ZoomView, which zooms in on frames and enlarges the text. It’s not as intuitive as comiXology’s similar engine, but still works really well. Barnes & Noble added digital catalogs to their offerings with the launch of the HD and the interface here is similar to magazines. Catalog pages have an additional feature: direct shopping links. Tap on a product you like to get more information and tap once more to go right to the website where you can buy it. Keeping track of the specific pages and products you like and want to buy later is made easier by the Scrapbook feature. 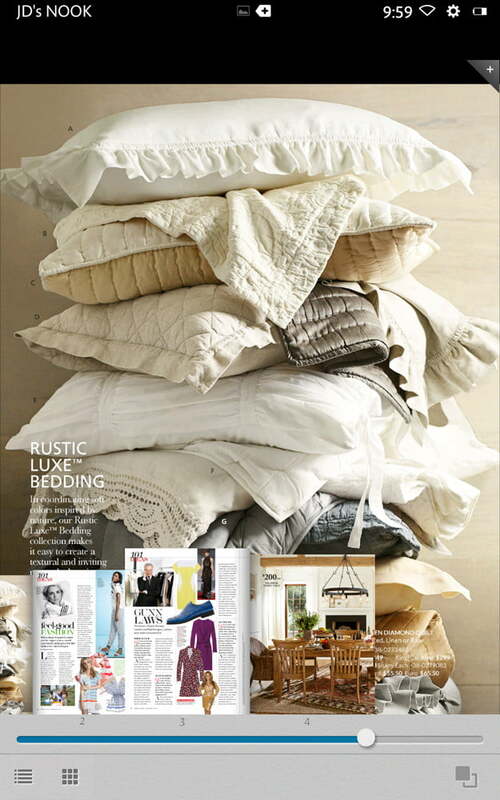 This allows you to “tear” digital pages from a catalog or a magazine and add them to any number of custom scrapbooks. The scrapbook then acts like a magazine – flip pages; see all contents, bookmark, etc. The only thing missing is ArticleView, but you can pinch to zoom. You can’t give people a beautiful, HD screen without also giving them a way to watch beautiful, HD video on it. To that end, Barnes & Noble finally launched a video service with the Nook HD. The selection in Nook Video isn’t as robust as Amazon’s for the Kindle Fire, especially in the TV section. 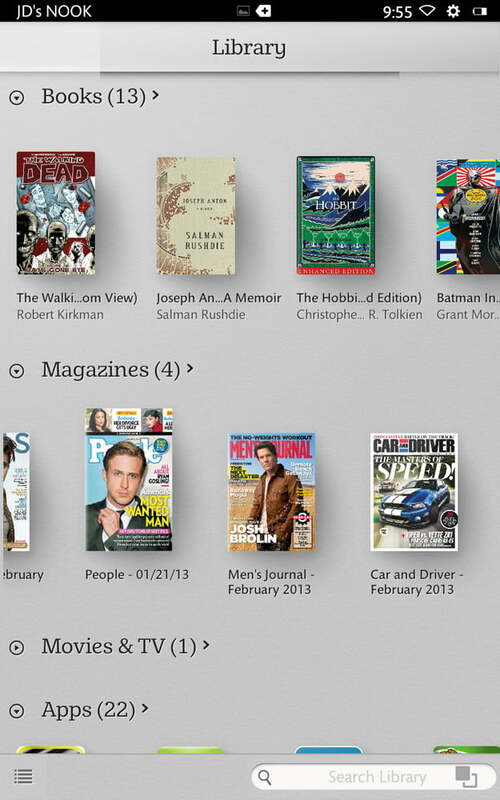 If your focus is on new movies, the Nook’s selection is mostly on par. Plus, you can connect Nook Video to an existing UltraViolet digital content account, which gives you the ability to stream or download movies purchased via that service as well. As before, the HD supports both Hulu Plus and Netflix. Watching HD video on this screen is quite nice thanks to the bright, rich colors, deep blacks, and overall crispness. The HD also makes a nice frame for high-resolution photos. The only drawback in the multimedia experience is the speakers. Once again, they sit on the back of the device and get muffled when you set it down on a soft surface. When unobstructed, the volume isn’t stunning and easily overpowered by medium background noise. You’ll want some headphones for this. The 30-pin port on the bottom supports full 1080p HD output via a dongle (sold separately). Owners can use this to play games, watch video, browse the web, or anything else on a big screen. The Nook app store continues to grow and gather top apps, but still lags behind the selection available via Google Play and the Amazon App Store. Currently, there are over 8,500 available with a focus on games, kids, lifestyle, and reading-related titles. 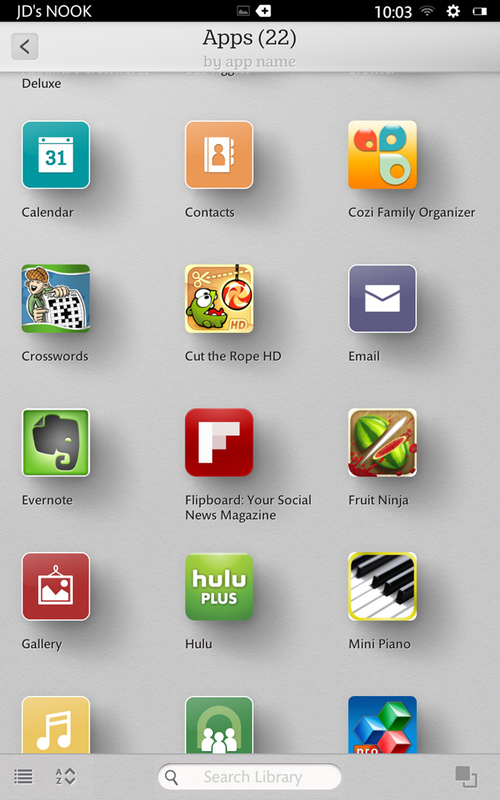 Many top apps are missing, and if this is your focus then the Nook HD may not be the tablet for you. For people more focused on the reading aspect, this isn’t a big deal. 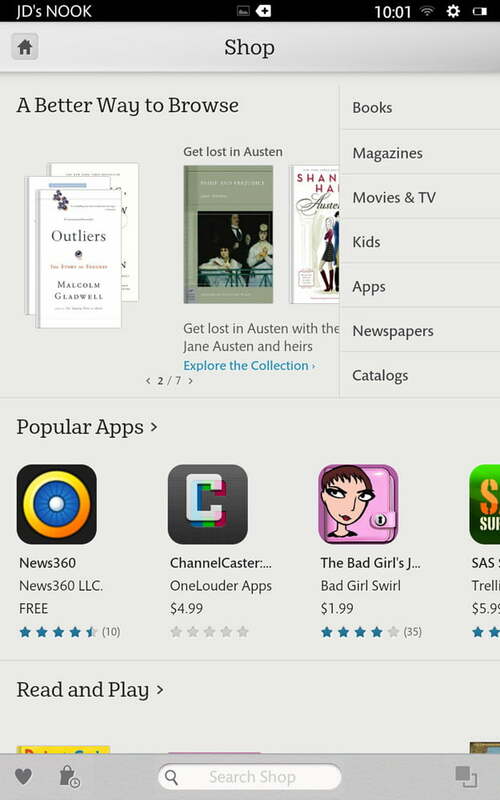 B&N vastly improved their own app offerings, especially the browser. It now includes an ArticleView button as well that simplifies websites, taking away the layout and just presenting the text. This way you don’t have to bother with zoom and have all the font and text options from the e-book side. The Nook HD runs on Android 4.0 with a custom interface that is both attractive and intuitive, something stock Android can’t always claim. There are some limitations: no side-loading Android apps or access the Google Play store (unless you root it). Otherwise, we appreciate the well-designed interface and the level of organization it offers for the different content available. The best aspect of the interface is the ability to create profiles. Everyone in the family can share one Nook HD yet won’t have to wade through someone else’s books and magazines and apps to find the ones they want to read or use. Most importantly, kid profiles make it possible to restrict younger users from inappropriate content on the web, in books, apps, and more. 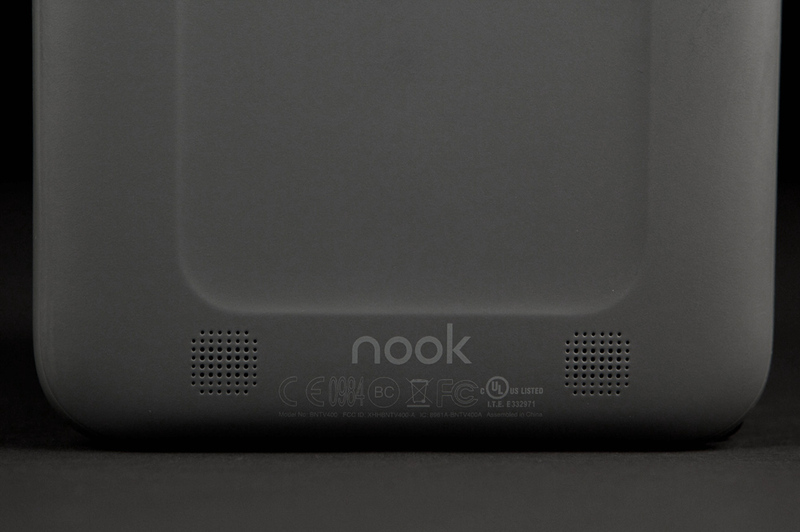 The Nook will stop kids from making purchases without approval or from seeing the content adults have in their profile. Profiles can be password protected or not, and it’s easy to switch right from the lock screen. Inside the Nook HD is a dual-core, 1.3GHz TI OMAP 4470 processor backed by 1GB of RAM and 8GB or 16GB of internal storage. 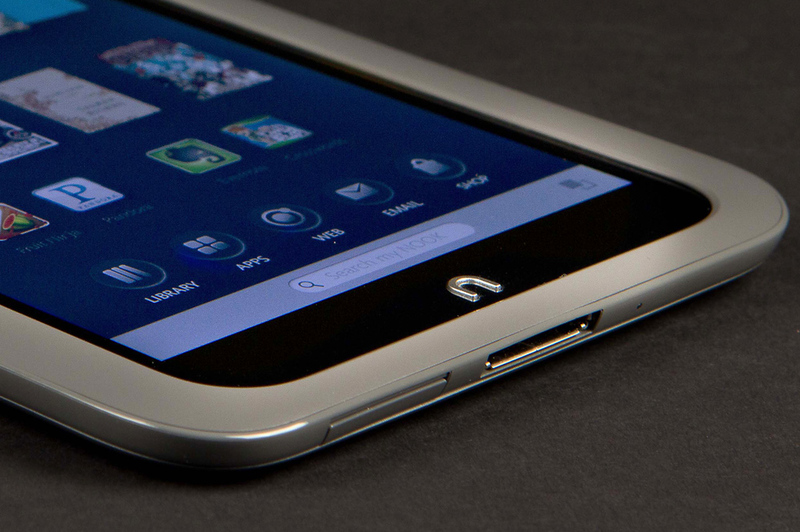 The microSD slot takes cards up to 64GB. For connectivity there’s b/g/n Wi-Fi and Bluetooth on the wireless side and a 30-pin port for USB and HDMI (with dongle). We found the Nook HD fast and responsive when playing games and watching video. Turning pages in eBooks and digital magazines is also smooth with high framerates. Streaming video played without incident and we didn’t have issues with long buffering pauses or dropped connections. When playing games that require an accelerometer, the response rate wasn’t as quick as we’d like. But overall, the tablet performed well in our hands-on tests. Battery life proved long, even with such a bright, hi-def display. While watching videos the HD lasted for over 7 hours. While reading, surfing the web, and playing games, the tablet kept going for over 8 hours and still hadn’t completely run out of juice. Using it off and on, it lasted for two days before needing a charge and didn’t lose too much power when asleep. Of all the 7-inch Android tablets available, the Kindle Fire HD is the Nook HD’s main competitor since they’re both restricted in comparison to tablets like the Nexus 7. How do they compare? The Nook HD is lighter and more comfortable to hold, has a higher resolution display, offers smoother performance, a more attractive and customizable interface, and better looking magazines and kids books, plus contains no ads. The Kindle Fire HD has better speakers and sound quality, a much larger app selection, a bigger media library that includes music as well as video, and a front-facing webcam. On balance, if multimedia or apps are more important, the Kindle Fire has a better selection. But if you’re choosing based on that, the Nexus 7 beats both of these. The Nook HD is still a worthy tablet contender, even though there are now many more Android tablets that match its low price. Cost isn’t everything, and the Nook’s features are compelling, especially for people who love to read and use their tablet mostly for that purpose. We like that there are more multimedia options now and the display is beautiful. Plus, profiles mean that parents can hand this tablet off without worrying kids will get into content they shouldn’t. However, this tablet isn’t for everyone. Consumers looking for a tablet that has no restrictions and access to every Android app (including the Nook app) and a bigger content library won’t dig this product. Compared to similar products, like the Kindle Fire HD, the Nook HD is superior.